The Stanley Cup Final could wrap up tonight with a Penguins win on home ice. Pittsburgh’s three previous Stanley Cup victories (in 1991, 1992 and 2009) all came on the road. In fact, no major pro Pittsburgh sports team has won a championship at home since the Pirates in 1960. So it’s no surprise that scalpers are asking a lot for this game. Highest price I saw last night for a single seat at ice level was nearly $12,000! 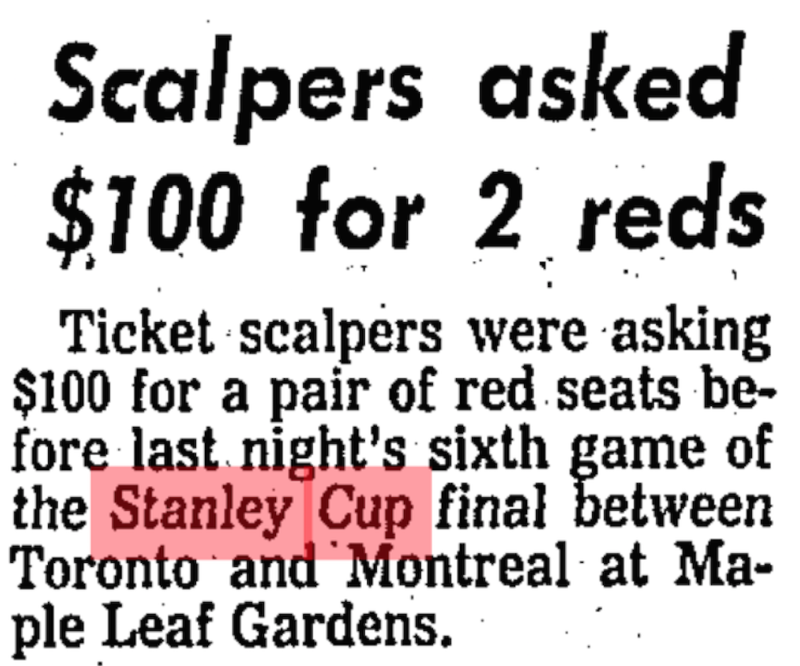 Who knows if they’ll get it, but they’ll certainly get a lot more that what the scalpers wanted the last time Toronto won the Stanley Cup according to The Globe and Mail on May 3, 1967. 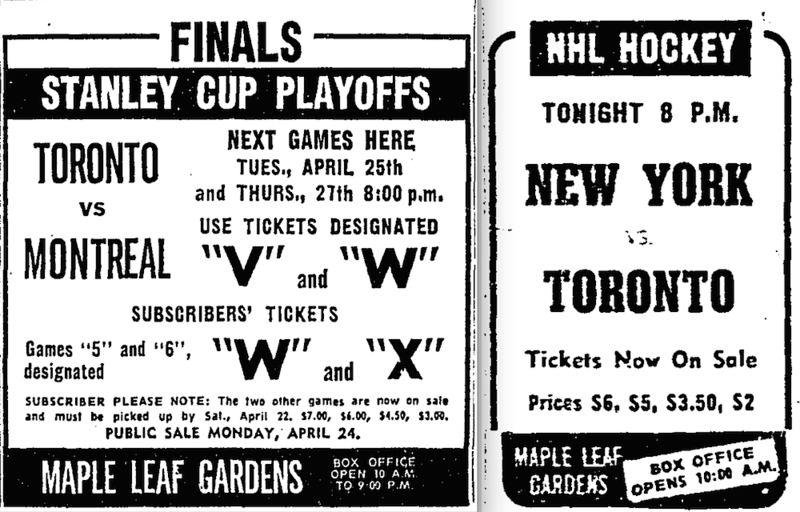 Check out the face value of 1967 Leafs tickets shown in the ads below. Notice in comparing the two that they raised the price a whole dollar across the board for the playoffs! And for those who don’t know, the reds being scalped in the story above were the best seats the house at Maple Leaf Gardens back then. According to what I could find online, the median household income in the United States was about $7,200 in 1967. Canada was likely pretty much the same. The most recent data for the U.S. shows about $54,000 as the median income in 2014. 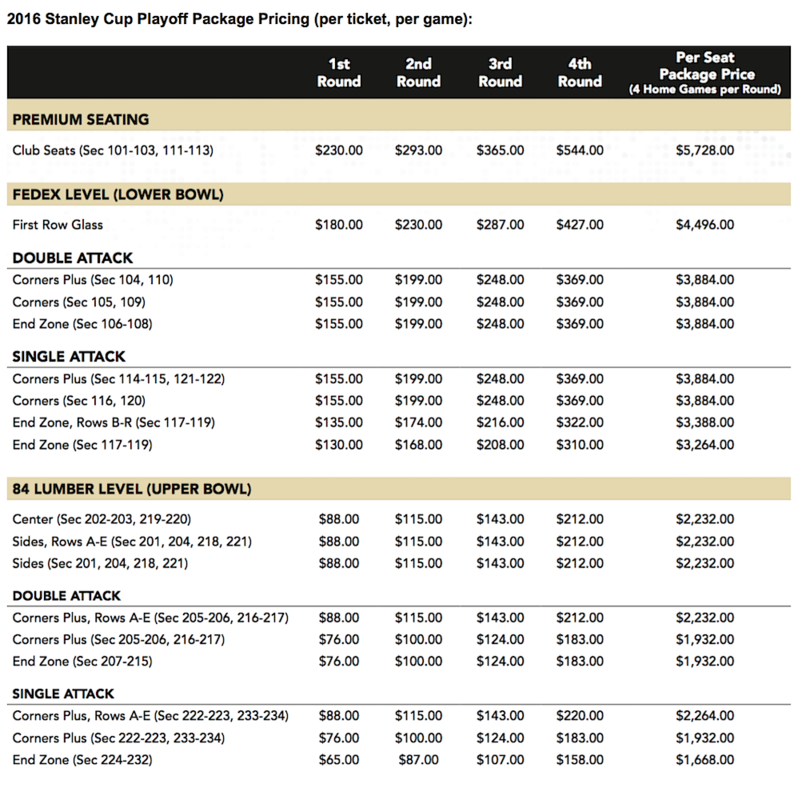 Just using some basic math, it seems to me that while income has increased by a multiple of 7, the face value of a top-price Stanley Cup ticket is 77 times more! So my guess would be there were a lot more working stiffs in 1967 who could afford $7 for a ticket then there are who can afford $544 today. And even $50 on a yearly income of $7,200 would be about half a week’s salary for half of that $100 pair. A half-week’s salary of $12,000 today would net you about $1.2 million per year! I guess there are plenty of people who actually make that kind of money … but I sure don’t! Wow! Good job I’m not that into hockey. Both sets of prices are unbelievable! I don’t know which ones I am more surprised about. Thanks for such an interesting blog. By the way how much would a pair of “Reds” from the 67 series be worth on the collectible market today? I think a pair of reds from the 1967 Cup would go for more than $100 on the collectibles market … but a lot less than $12,000! See this link to a bunch of green seats from 1967 on Classic Auctions a couple years ago. Looks like it sold for $525. Confirms my memories of my Dad telling me that, as a young man with little money, he occasionally went to the Forum to see his beloved Habs play, and even saw some playoff games. That would have been in the mid to late 1940s. …it may not have been ’67, (I’m a geezer…I can’t remember if I put on any underwear this morning!) but it wasn’t too much further back than that, when a ‘quart’ of beer (We drank ‘quarts’ in the taverns back home in Pointe Claire, QC.) cost $0.40, and did for years, until it finally went up to $0.45. We gave Jean, our waiter, $0.50….and EXPECTED him to keep the change. And by-the-way, Jean, in all the years would NEVER have ever presumed to keep that dime or that nickle, he always, 100% of the time offered the change back or put it on the table in place of one’s waiting four bits…..and further to that, when it DID go up to $0.45 and we, collectively, switched immediately to offering up $0.60 or $0.75 (three quarters), Jean would still INSIST on giving us back our $0.15 or $0.30 change, essentially returning part of the exact monies we had handed him. He actually told us that we didn’t need to give him more than the habitual ’50 cents’ even while he knew he would be cutting his tips in half. (He had three kids!) In half! It took us at least a couple of weeks of insistence before he FINALLY succumbed and started giving us back (we weren’t ever going to change that part!) three nickles or two dimes and two nickles in order that we could maintain the giving of his dime tip on the quart! This also says something about the times although, probably, MORE about the man! …the point being that in ’64-’67ish when a ‘quart’ of beer was $0.40/$0.45 (And don’t forget, a ‘quart’ of beer was 22 oz!) and today, a ‘pint’ (20 oz)…[IF you can find a true ‘pint’ anymore…hell, a ‘pint’ runs the gambit of 14 oz. to 22 oz…rarely the latter…and that latter would cost even more!] runs, on average, at most ‘regular’ pubs, bars around $8….IF you’re lucky. $0.40 to $8.00 = + 2000%….and remember, that is just at the ‘regular’ joints that STILL serve ‘real’ pints! PS…Quite a day. ‘My Man’ and friend, Gordon ‘MR. HOCKEY’ Howe…a.k.a. ‘The Gord’ passes and ‘THE Man’…’THE GREATEST’ is laid to rest in the most positively memorable televised funeral service that this humble geezer has ever witnessed. A day for a lifetime…x 2!